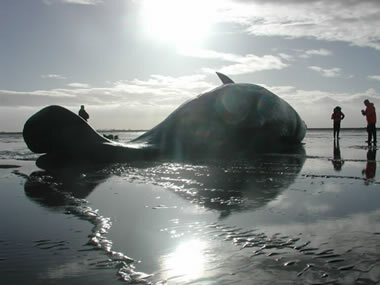 The UK Cetacean Strandings Investigation Programme (CSIP) has been running since 1990 and is funded by Defra and the Devolved Administrations. We coordinate the investigation of all whales, dolphins and porpoises (collectively known as cetaceans), marine turtles and basking sharks that strand around the UK coastline. As well as documenting each individual stranding, we also retrieve a proportion for investigation at post-mortem to allow us to establish a cause of death. The data and samples collected during the course of our research have also facilitated a large number of international collaborations, which have addressed a wide range of scientific questions. Why do we need a strandings network? Unfortunately, cetaceans regularly strand around the coast and information received on stranded animals can provide an accurate picture of what species are found in UK waters and show local and seasonal distribution. Strandings that undergo post-mortem examination provide us with valuable information on causes of death, disease, contaminants, reproductive patterns, diet and also useful pointers to the general health of the populations living in the seas around our coasts. This provides useful baseline data to help detect outbreaks of disease or unusual increases in mortality. The CSIP depends on the publics help in the reporting of strandings around the UK – please click on the link for more information on how to report a stranding.